A union representing UC student workers voted Tuesday to authorize a strike after its members alleged UC managers used intimidation tactics against them. United Auto Workers Local 2865, which consists of UC academic student employees, graduate student instructors, readers, tutors, teaching assistants and others, announced on Wednesday that it will strike on Nov. 20 in solidarity with the members of the UC patient care and service workers’ union, AFSCME 3299. 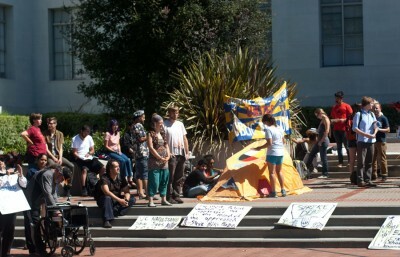 The authorization, which was approved by 96 percent of voters across the UC system, was meant to demonstrate to UC officials that the union was prepared to strike if its members deemed it necessary, said Caroline McKusick, an executive board member of UAW 2865. UAW 2865 regained its right to strike when the no-strike clause in its contract expired Nov. 5. 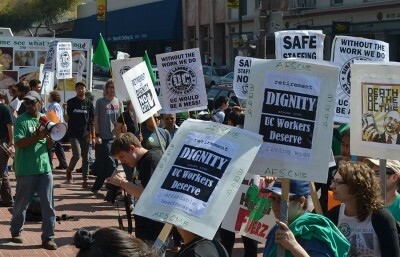 AFSCME 3299 will strike against alleged unfair labor practices by the UC. The vote to authorize a strike arose after UAW 2865 members claimed UC management used illegal intimidation tactics against them. 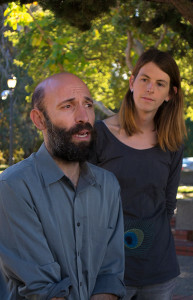 The claims include a recent incident at UC Berkeley in which a group of graduate student union members were filmed by police when they attempted to deliver a letter outlining their demands to Graduate Dean Andrew Szeri. However, UC spokesperson Shelly Meron said in an email that Napolitano has visited several UC campuses in the past few weeks and has heard about a variety of issues from students firsthand. Meron said Napolitano realizes that more needs to be done for graduate students and plans to add $5 million to the President’s Postdoctoral Fellowship Program, “which directly supports recently graduated Ph.Ds who teach and conduct research at UC before beginning their careers in academia or industry,” according to its website. The university and union have bargaining dates scheduled next week. “We are making slow progress and hope to reach an agreement with UAW very soon,” Meron said. McKusick expects the strike to have a serious impact on teaching at the university because graduate student instructors and teaching assistants, among others, would refuse to work.